Of the five incumbent MPs, four have been re-elected, despite government moves to discredit them. Four are facing sedition charges over the 2006 riot in Nuku'alofa. Despite that, most were returned with increased majorities. But first-time candidate Sangster Saulala narrowly missed out finishing fourth on Tongatapu but second in several rural polling stations. Saulala is also facing charges in relation to the 2006 riot. Less than 50 percent of Tonga's registered voters turned out on the day. Voting in Nuku'alofa was heavy but in the rural booths, voter turnout was reportedly lower. 'Akilisi Pohiva, former broadcaster and publisher of Kele'a, and long the leader of the Democracy Movement, topped the poll - as expected - with 11,290 votes. This was more than 4000 votes clear of the next highest polling candidate 'Isileli Pulu. Another pro-democracy MP, Clive Edwards, a onetime notorious Police Minister, who jumped the political fence, had the biggest jump of any candidate, says RPN. He polled with thirteen hundred more votes than he did in the last election. Pohiva doesn't want to see any slowing of change in Tonga - he would like debate continued next month and electoral reforms embedded before the coronation of King George Tupou V in August. "The Herald fulminated that the bill would require anyone wanting to spend any of their own money electioneering to register with the Electoral Commission. That seemed to grossly restrict everyone’s political free speech - an impression underscored by the subhead 'Speak now or next year hold your peace'. But it wasn’t true. Only those who want to spend more than $12,000 electioneering (or $1000 in an electorate) need to register. Still, much better for the Herald’s campaign to brush over the fact that this would only affect a small number of wealthy people and organisations. "Most irritating Herald argument: its mistake didn’t really matter as “it does not undermine our general view of the shortcomings of this bill.” Well, bully for the Herald. But one might have hoped that they would have felt embarrassed to advance this as a justification for failing to publish accurate information and let readers make up their own minds." Tonga - another 'media Zimbabwe'? Just when Tonga seemed to be making some headway in opening up to media freedoms and lively debate in the transition as an emerging democracy, a major blow has hit the state-run broadcaster with a tough restriction on political broadcasts. Would-be political journalists have had the rug pulled from under them just as the kingdom heads into an election. The Tonga Broadcasting Commission imposed a ban on reporters doing pre-recorded political interviews (without a vetting committee clearance) with the general manager ‘Elenoa ‘Amanaki claiming journalists didn't have the training or experience to do their job. What a scandalously demeaning statement about TBC's one journos. This is a reflection on the TBC rather than the journos. Journos gain experience by being on the job - and that means covering the elections. And what has been happening on the training front if journos are suddenly regarded as not up to the job. Why now? And why the "admission" on the eve of an election? 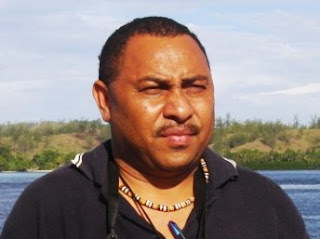 PINA was a bit slow off the mark, in spite of many journos around the region clamouring online for a strong statement, but eventually PNG-based president Joseph Ealedona rapped the kingdom with a blast against censuring or privatising public broadcasters. Among many online critics have been the Tonga Review, which likens Tonga to Zimbabwe: "Tonga and Zimbabwe have something in common - restriction of freedom of speech. The latest government censorship on political campaigns for the upcoming election is similar to what media are experiencing in Zimbabwe. It is also similar to the way China and police states treat media. Freedom of the press is enshrined in our Constitution but it seems that the authorities are clinging on to the old adage that the 'state' knows what’s best for the media, especially state media, to communicate to the public. "In an age where media freedom, albeit responsible media reporting, is critical for keeping governments honest, Tonga now seems to be heading the other way and dictating how its state broadcaster speaks to the people. This sets a dangerous precedent because the authorities can become brainwashed thinking that they know what is best for the people. "The TBC is chaired by the Prime Minister and he has instructed officials to go through political programmes and edit any political rhetoric. This has caused controversy amongst the pro-government and pro-democracy movement. Officials have now become the authority over what can and cannot be said to the public. "The problem is, you have some programmes that are pro-government such as the ones by Kalafi Moala and Viliami ‘Afeaki which is often critical of the Peoples Representatives and they are allowed and sponsored by government to be aired weekly. This is unfair and creates animosity against the state broadcaster." Tonga Review adds that the country's political leadership has "destroyed" the Fourth Estate. A bit sweeping - as the comparisons to totalitarian China. But definitely transparency and accountability have suffered a severe setback. Pictured: PINA's Joseph Ealedona ... call for Tongan media to perform 'without fear or favour'. A newspaper columnist has been gunned down in Manila suburb - the first journalist to be murdered this year. 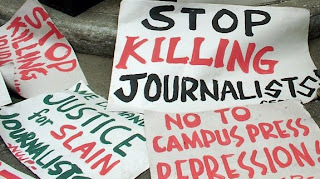 Journalists have been murdered or assaulted with some alarming frequency that authorities established a special police unit to investigate cases of violence against the media. Reporters Without Borders has been quick to put out a statement that it is "shocked" by the murder of newspaper journalist Benefredo Acabal in Pasig City on April 7 and calls on the authorities to do everything possible to establish the motives and bring those responsible to justice. Acabal, 34, was a columnist for The Pilipino Newsmen, a Cavite tabloid. He was shot five times at close range by a man on a motorcycle and was pronounc ed dead on arrival at a hospital. The police officer in charge of the case, Lardy Ignacio, said it was too soon to say if the murder was linked to the victim's work as a journalist. The police are looking into the possibility that it was linked to Acabal's involvement in a trucking business. Greenpeace isn't on the port of Lyttelton's Christmas card list any more - if it ever was! But the charmed public image of the global environment lobby and activist group in New Zealand took a beating with a high profile attempted blockade of a "legal" shipment of coal to China late last month. This spectacular protest against the Hellenic Sea led to six arrests and ill-informed mutterings by the local establishment about Greenpeace tactics. In a Press article this weekend , Philip Matthews raised the question of whether the message about climate change is a harder sell than the old "black-and-white" issues of nuclear-testing and waste. But current Greenpeace executive director Bunny McDiarmid, who was a crew member on the original Rainbow Warrior at the time of the bombing by French state-terrorists in July 1985, reminds us about the harsh reality of back then. The RW's tactics were to try to get in the way of ships before barrels of nuclear waste could be kicked overboard. It's a shocker: back then, dumping nuclear waste was entirely legal. Greenpeace's action, both at sea and behind the scenes, were instrumental in having nuclear waste declared illegal. "A lot of things that are considered legal today will be illegal tomorrow," she says. I am quoted in the article about "classic Greenpeace" tactics to boost public awareness of the broader issue - in this case climate change. In the earlier post-bombing years, Greenpeace - small, non-violent, determinedly independent in terms of not taking money from governments or corporations - was like an idealised version of New Zealand itself in the early years of the nuclear-free legislation. But the movement took a dip in membership in the 1990s as self-interest began to dominate community values. It's refreshing to see these grassroots protests making their mark. The Fiji news media gets a lot of ticking off these days. And a major critic remains Interim Finance Minister Mahendra Chaudhry, who just last month branded the media as "divisive and racist", saying it should be "licensed". He claims the media isn't responsible with the freedom it has been given. This is a familiar theme, of course, and he has filed Fiji's biggest-ever damages claim for defamation. There were very defensive rumblings from the media in response to the recent discredited Anthony report on the "freedom and independence of the media". And there have been allegations by media of computer hacking. 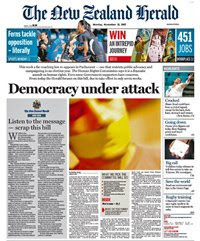 This led to a strong Fiji Times editorial challenging the regime - "put up or shut up"!. But the flaws of the Anthony report don't change his essential message - there are serious problems in the Fiji media about training/professionalism and credibility and they need to be addressed. If not, then the regime or a future Fiji government is likely to impose something that is draconian and counter-productive. Yes, the regime is disreputable and civil liberties, press freedom and the rule of law have been trampled on after the military coup. But media reports, such as in New Zealand, giving the impression that Fiji is a "Zimbabwe in the Pacific" (at least prior to the apparent ousting of Mugabe from office), is far from the truth. But, as many media people in Fiji point out, those not on the ground in Fiji and reading the reports would be inclined to be alarmed. The international image of Fiji has taken a battering, resulting in pressure from overseas governments and their refusal to grant any concessions to the regime. The regime shot itself in the foot also by some misguided actions and is rightly blamed for the state of affairs. But the media is able to question and criticise the regime at will. There is some intimidation but not like in the early days of the coup. In fact, if the media is put under as much scrutiny as the regime, there are many flaws in the coverage, but the reporting "power" is held by the media. The hysteria over the de-reservation of land that was kicked up and stoked by the media was clumsy and revealed lack of depth in reporting and editorial skills. A big deal was made about the fact that reporters would no longer be able to call up the interim PM on his cell phone. Somehow this was supposed to be a yardstick for "media freedom". Where else in the world can journalists call up a PM on the phone for interviews? It has been forgotten that the military ousted a government that was racist, divisive, corrupt and inefficient and consorting with coup-makers. The difference was that the Qarase government was cynically using democracy and existing laws to legalise its racist and illegal policies. One of Qarase's ministers referred to Indo-Fijians as "weeds taking up too much space" while some senators called reporters "Satan's agents". They were not even reprimanded. In his last days, Qarase, in a desperate bid to cling to power, tried to incite indigenous Fijians to rise against Indo-Fijians by claiming that they supported the military. So the man was willing to see the shedding of blood to remain in power. It was another example of how callously some leaders use the people for their own benefit. The media, naïve as it is, has made a ruthless politician and a dangerous leader like Qarase, appear "angelical"! The Qarase government should also share blame for the coup. Had it remained in power, it is quite likely we would have seen some coup-makers in Senate, Parliament, in plum government jobs and holding board memberships. It would have increased consumption tax to 15 per cent to pay for its reckless spending. This would have strangled the poor even further. If not for the coup, the shenanigans at the Fiji National Provident Fund would not have come to light. The national pension scheme quite likely would have gone down the tubes as the National Bank of Fiji did. Under the Qarase regime, even the workers' pension scheme was not safe or sacred. Fiji had become a magnet and haven for conmen and carpetbaggers. There is criticism that no "hard evidence" has been uncovered to prove widespread corruption as claimed. Corruption is never easy to prove, more so in a country like Fiji which simply does not have the expertise. But there is enough prima-facie and anecdotal evidence to show there was something very sick in many organisations. Journalists in countries such as New Zealand need to be prepared do the research, talk to credible people and get a cross-section of views instead of repeatedly using biased sources who are often not even in Fiji. Constantly only talking to those hurt by the military and who have reasons to hate it, inevitably serve up a less than balanced view. There are many people with an axe to grind against the military, and there is a danger of them using the media to achieve this end. Of course the media will be quick to deny any such possibility but we all saw how easily the media was manipulated during the Speight and Rabuka coups. The media needs to be careful that it doesn't inflame racial feelings and buy into imposed external solutions with a double standard. The struggle for democracy could easily explode into an Timor-Leste style catastrophe.